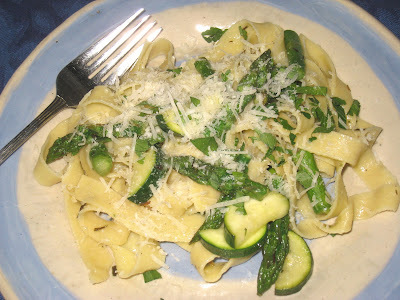 This is a lovely little dish I like to trot out when asparagus and zucchini are in season. It is especially good with fresh pasta, although dried will do the job if that is all you have available. This recipe falls under my ongoing attempts to practice the theory that "less is more." When the ingredients are fresh, there's no need for excess herbage and seasoning. All you really need to do is find a simple way to highlight the main ingredients. This recipe does exactly that and is quick and easy. You can have dinner on the table in about half an hour. Place a large pot of water on the stove over high heat and bring to a boil. When it is boiling, add salt and the asparagus and zucchini and cook them for 2 to 3 minutes. Remove them from the water and plunge them immediately into cold water. Drain and set aside. Heat the oil in a large skillet over medium-high heat. Add the onion and saute it for a few minutes, until translucent. Add salt and pepper to taste. Add the wine and let it cook down for a minute. Add the pasta to the boiling water and let it cook for about 2 to 3 minutes if using fresh (about a minute less than the designated cooking time - if using dried pasta adjust cooking time accordingly). Add the asparagus and zucchini to the onions and cook until heated through. When the pasta is done, reserve about a cup of the pasta water and drain, then add the pasta to the asparagus and zucchini in the skillet. Cook for 2 more minutes, mixing everything together and adding pasta water as necessary. Remove from the heat. Serve immediately garnished with parsley and cheese.